Expected Release: March 20, 2019. Date subject to change. "Faction Check: ERROR." This is your first thought as you boot up in a holding cell surrounded by Robots and Androids. You don't remember much, but you know you need to get out. Give your part of the keycodes to your faction leader, and you'll be free-but from which faction are you? And why does the giant screen in front of you say, "You Cannot Tell The Truth to A.I.s"? 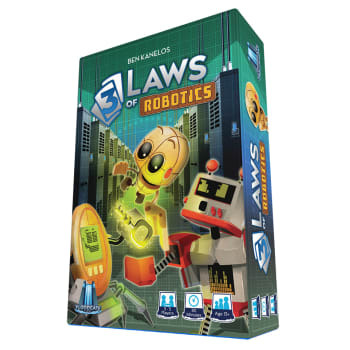 3 Laws of Robotics is fast-moving deduction game in which you know everyone's information (robotic faction and rank) except your own. Each round, you ask a single question to try to figure out who is on your side, being sure to obey the new laws as they're added. Ask the right questions, find your team, and escape victorious! The super-engaging gameplay has no player elimination and is lightning-fast to set up and learn. The new rule combos each game allow for high replayability.